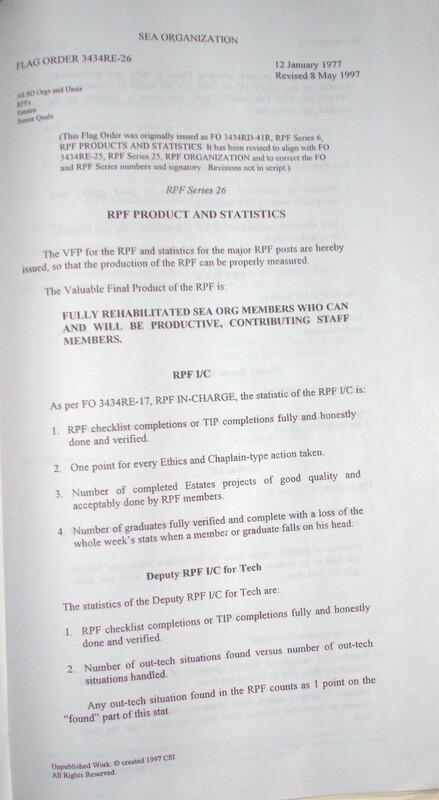 The VFP for the RPF and statistics for the major RPF posts are hereby issued, so that the production of the RPF can be properly measured. FULLY REHABILITATED SEA ORG MEMBERS WHO CAN AND WILL BE PRODUCTIVE, CONTRIBUTING STAFF MEMBERS. 1. RPF checklist completions or TIP 2 completions fully and honestly done and verified. 2. One point for every Ethics and Chaplain-type action taken. 3. Number of Estates projects of good quality and acceptably done by RPF members. 4. Number of graduates fully verified and complete with a loss of the whole week’s stats when a member or graduate falls on his head. 1. 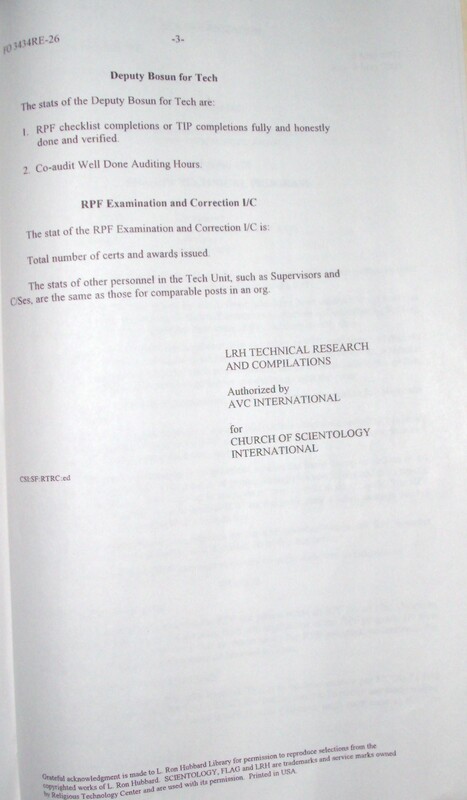 RPF checklist completions or TIP completions fully and honestly done and verified. 2. Number of out-tech situations found versus number of out-tech situations handled. Any out-tech situation found in the RPF counts as 1 point on the “found” part of this stat. When each out-tech situation found is fully and terminatedly handled by the D/RPF I/C for Tech per his duties as covered in F0 3434RE-25, RPF ORGANIZATION, one point is counted on the handled part of this stat. 1. Number of completed Estates projects of good quality and acceptably done by RPF members. 2. RPF checklist completions or IIP completions fully and honestly done and verified. Percentage of individuals in Normal or above in both work and in study/co-audit. 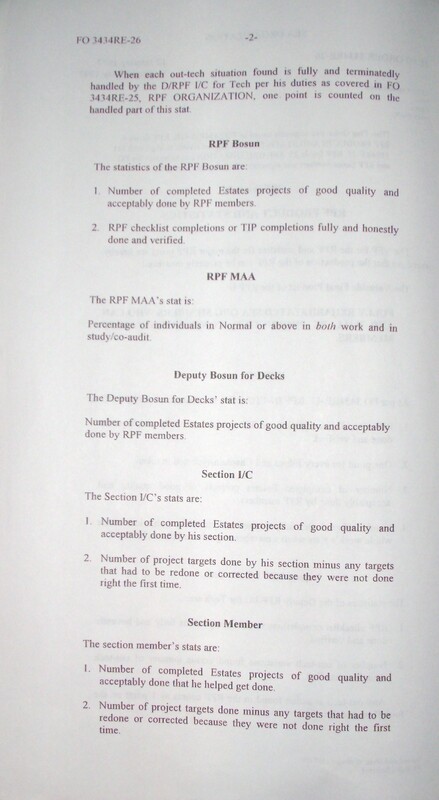 Number of completed Estates projects of good quality and acceptably done by RPF members. 1. Number of completed Estates projects of good quality and acceptably done by his section. 2. Number of project targets done by his section minus any targets that had to be redone or corrected because they were not done right the first time. 1. Number of completed Estates projects of good quality and acceptably done that he helped get done. 2. Number of project targets done minus any targets that had to be redone or corrected because they were not done right the first time. 2. Co-audit Well Done Auditing Hours. Total number of certs and awards issued. The stats of other personnel in the Tech Unit, such as Supervisors and C/Ses’ are the same as those for comparable posts in an org.